No matter the age of the flooring, you can still keep it in great shape. How old are your current hardwood floors? Have they been dinged up or permanently stained through long years of faithful service? No matter the age of the flooring, you can still keep it in great shape. Even so, keeping your hardwood floors clean can be quite challenging. Fortunately, we have put this guide together to help you. First of all, some simple maintenance can make a huge difference. If you don’t sweep or vacuum your hardwood floors at regular intervals, you should consider doing so. 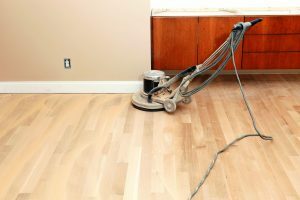 By following a strict routine of sweeping and vacuuming, you can prevent dust from building up on your floors and making them appear older and more worn out than they might truly be. Preventing excess dust is one just one benefit – another is getting rid of any abrasives that might be hiding but can’t be easily seen. These abrasives can leave scratches and gouges in the finish of the floor. By protecting your floor’s finish, you can also protect the floor itself. Any time there is a spill, clean it up right away. This will protect the wood against any damage from liquid exposure. You should also keep mats near entrances and exits. The mats will keep out other less obvious abrasive materials, such as sand. Don’t use rubber for mat backings, or any other similar materials, that might trap air underneath them. Unfortunately, these backings will hang onto abrasives and humidity. Put pads underneath chair legs and other pieces of furniture. These pads can prevent accidental scratching. Do your best to keep these pads as clean as possible and change them out whenever necessary. Likewise, protect your flooring when you know you will be moving furniture around. To do this, all you need to do is reverse a mat and pair it with a small piece of plywood. This technique should allow the furniture to glide without any trouble. Trim your pets’ claws so they don’t leave scratches, either. Sun damage will fade the look of your floors as well. While using special finishes can slow down this process, it will still happen regardless, so keep that in mind. When cleaning your floors, don’t use wax or oil based cleaners. Don’t rely on normal household cleaning products, either, as these won’t help. This entry was posted on Thursday, August 31st, 2017 at 7:34 pm. Both comments and pings are currently closed.